To my delight this cute little cookie box reminded me of scrapbook paper. All it need was a bow and it made the perfect home for these darling Cottage Cutz snowmen. On the front, I used the Cottage Cutz snowman with the broom. I added a few snowflakes to give it a little sparkle. On the top, I used the Cottage Cutz mini snowman. There are so many wonderful Cottage Cutz dies to choose from to enhance all of your wonderful projects!!! 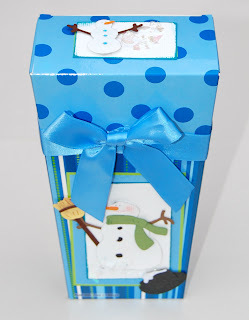 Cute snowman box Ann - dies are a great way to dress up store bought bags and boxes for just about any occasion. I like how you added the mini snowman on top too!